The treatment of the high-spin d5-configurated iron(III) cation in 6- and 4-coordinate ligand fields is a highly complex matter. The 6A1-ground state allows only spin-forbidden transitions, here of relevance to ten spin-reduced 4A1-, 4A2-, 4E(2x)-, 4T1(3x)-, 4T2(3x)-states, which are not easy to handle. Though the literature offers a series of carefully prepared solids with beautifully resolved ligand field spectra, the philosophy of utilising these in terms of their binding character, particularly in respect to the d-electron cloud density between cation and the anions, diverges. Accordingly, the magnitudes of reported ligand field parameters Δ and of the Racah parameters of interelectronic repulsion B and C, which parameterise the mentioned effects, differ, and comparisons become difficult. In this review we propose a well-founded and comprehensible calculational procedure, in order to, as the main matter of concern, convince the readers that the ligand field spectra also sensibly reflect finer perturbational details of local or even cooperative binding quality. The origin of the latter effects is from the chemical environment beyond the first coordination sphere of a central, say FeIIIL n -complex (n = 6,4) in an extended solid. Already subtle disturbances of this kind will modify the shade of colour. An essential point of the discussion is the symmetry analysis, which provides rigorous constraints and sets strict conditions on what can be experimentally observed. We will first discuss manganese(II) in oxidic solids. Because a divalent cation is associated with rather ionic binding properties towards oxygen, crystal field theory is the appropriate analytical instrument. Iron(III) provides a situation, which requires more sophistication and a refinement of the theory by taking also bond covalency into account. A symmetry-based reinterpretation of the additional absorptions in the d–d-spectra of FeIII and CrIII in corundum-type solids is presented. This treatment sheds new light on the finer roots of the impressive red-to-green colour change of Cr3+ in mixed crystals Al2−x Cr x O3 with increasing x. Particular examples are discussed, where absorptions due to octahedral and tetrahedral iron(III) overlap in the ligand field spectra of spinel- and garnet-type solids, which model the hue in a predictable way. Finally, though not directly related to the primary topic, the charge-transfer properties of oxidic iron(III) are briefly examined. These absorptions often stray far into the visible region, with a very frequently significant influence on the apparent hue. 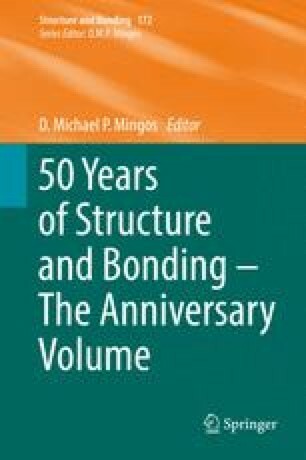 Dirk Reinen is the only surviving member of the founding editorial board of Structure and Bonding in 1966. C.K. Jorgensen, J.B. Neilands, R.S. Nyholm and R.J.P. Williams sadly are no longer with us. The technical assistance by Mrs. D. Kloss and Mrs. M. Köhler in transforming the manuscript and the figures, respectively, into a publishable shape is gratefully recognised. Here, the ligand field parameter Δ and the modified Racah parameters B and C account for the energy modifications due to placing the cation into an external crystal field. Accordingly, ten S = 5/2 – to – S = 3/2-transitions may be observed at the most, from which one (4A2g) and those with a positive Δ dependence (c 4T1g, c 4T2g) are expected only at very high energies; furthermore, two (4A1g, a 4Eg) are degenerate in energy. The 4Tg-matrices indicate that – according to a (near-to) (−Δ)- or (+Δ)-dependence – the spin pairing may occur in the t2g-(t2g 4eg 1) or in the eg-subshell(t2g 2eg 3), respectively, while the b 4T1g- and b 4T2g-transitions are expected to depend only weakly on Δ. The specific symmetry of the two 4Tg matrices in respect to Δ is the reason why the Eq. (7) can be used in the case of tetrahedral crystal fields as well. Though usually a change of sign due to the reverse splitting into a lower-energy e- and a higher-energy t2-orbital set in Td as compared to Oh has to be applied, this is needless here. After all, one is in the comfortable situation, that there are frequently four experimental data (6A1 → 4A1, a 4E; b 4E; a 4T2; b 4T2), from which only two unknown parameters have to be deduced. The interelectronic repulsion parameter B can be derived from the Δ-independent transitions, where the minimum positions of the ground- and excited-state potential curves coincide. These minima are displaced in respect to each other, if Δ is involved. Though the Stoke shift, which is the energy difference between a transition in absorption and emission, is rather small in the case of a divalent cation such as Mn2+, the derived Δ parameter is nevertheless – though modestly – semi-empirical in nature. It is hence expected that – within the discussed limits – the nephelauxetic ratio β = B/B 0 images the covalency properties near to reality and that also Δ is a parameter, which reflects changes in the binding quality in a sensitive manner, if one sticks to the outlined critical calculation procedure. Having this in mind, both parameters, B and Δ, constitute as reliable members of the nephelauxetic and spectrochemical series of ligands . It is, induced by the dramatic rise of the intercationic overlap parameter δ, the pronounced decrease of Δ, which mirrors the binding landscape specifically in the α-Fe x Al2−x O3-mixed crystals (see Table 3). Δ becomes smaller by at least 20%, when replacing chromium(III) by iron(III) in the corundum structure, in comparison to 10% or even less in spinel- or garnet-type phases. Considering the above outlined model arguments, this is an expected experimental result. Already discussed is the reduction of B (in 103 cm−1, see Eq. 11) by about 10%, which is observed, if the within-pair overlap comes up in addition (Table 3). We think that – though the iron(III) bonding properties in the corundum lattice are highly complex – the proposed model is an acceptable symmetry-adjusted approach to what one may call the truth.